1865 Alice's Adventures in Wonderland, ch.2,'The Pool of Tears'. 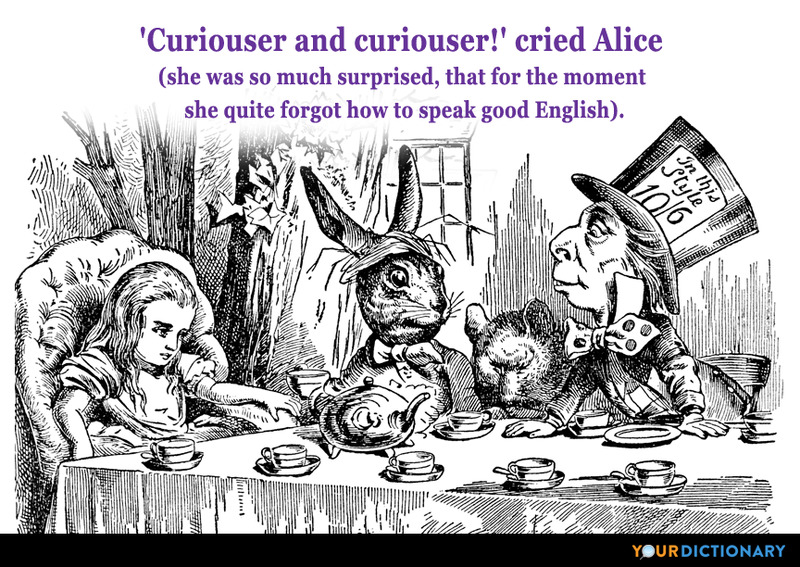 No one who was not by nature a lover of logic, and an extreme precisian in the use of words and phrases, could have written the two "Alice" books. From the moment I leave my house or my hotel room, the public owns me. The public made Alice Cooper and I can't imagine ever turning my back on my fans. Don't you remember sweet Alice, Ben Bolt?Sweet Alice, whose hair was so brown;Who wept with delight when you gave her a smile,And trembled with fear at your frown!  Ben Bolt, reported in Bartlett's Familiar Quotations, 10th ed. (1919). I can be President of the United States, or I can control Alice. I cannot possibly do both. You are the first person who has been able to illustrate the book adequately since Tenniel, though I still argue as I think I argued with you years ago that your Alice is a little bit too much of a gamin. He knew there must be a Ring, and he patted his pocket where he had it; he thought there should be a Best Man, though when he wrote so to Daily Alice she wrote that they didn't believe in that; and as for Rehearsals, she said when he mentioned them, "Don't you want it to be a surprise?" Alice had managed to get herself back under some sort of control, but it was thin. Thin enough to read a newspaper through , his bingo-playing mother might have said. Although a kid herself, Alice had managed to keep herself shiny-side up mostly for the other kid's sake, so he wouldn't give way entirely. I can be President of the United States, or I can control Alice . I cannot possibly do both.  Response when a dignitary asked if he could better control his daughter, as quoted in Hail to the Chiefs : My Life and Times with Six Presidents (1970) by Ruth Shick Montgomery, and TIME magazine (3 March 1980). Alice Toklas' father had almost once had an oil well they dug and dug but naturally the oil did not gush, naturally not these things never do happen to any one one knows, if it could happen to them you would not be very likely to know them most naturally not. I'll always be Alice Toklas if you'll be Gertrude Stein. I should have realized that having Alice as my only bridesmaid was a mistake. I would look that much more uncoordinated coming behind her. Promise me you won't forget... there once was an assassin named Alice.  Notes: Said when Travis asks for her name, before she falls towards Travis and allows him to cut her in half. Alice... you always said that I disgust you, but I... I love you.  Note: Said to Alice, after having been sliced across the back by Emil while trying to protect her from him.